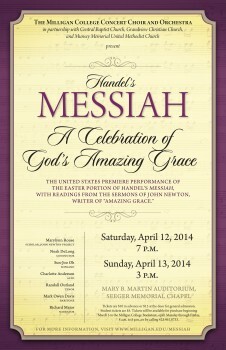 MILLIGAN COLLEGE, TN (March 3, 2014) — The Milligan College Concert Choir and Orchestra will combine with several local church choirs and professional soloists to present two concert performances of “Handel’s ‘Messiah’: A Celebration of God’s Amazing Grace” on April 12 and 13. The first performance will be on Saturday, April 12, at 7 p.m. The second performance will be on Sunday, April 13, at 3 p.m. Both performances will be held in Milligan’s Mary B. Martin Auditorium of Seeger Memorial Chapel and are open to the public. Tickets are now on sale in the Milligan Bookstore. This performance, which is the United States premiere of “Handel’s ‘Messiah’: A Celebration of God’s Amazing Grace,” covers the story of Jesus’ passion. It intersperses dramatic readings from the sermons of John Newton with the Easter portions of Handel’s “Messiah” in a beautiful concert that will draw audiences to the powerful message of God’s amazing grace. The original concept comes from a 2010 performance at the Gloucester Cathedral, given under the auspices of the John Newton Project. John Newton, a contemporary of Handel and the writer of “Amazing Grace,” preached more than 50 sermons from every biblical text in Handel’s “Messiah.” The Project’s objective is the transformation of society through faith in Jesus Christ, using the life and works of John Newton as one great example. In addition, Marylynn Rouse, a British scholar with the John Newton Project, will be on hand to introduce each performance and to give several lectures in the week leading up to the concerts. In addition to the Milligan College Concert Choir and Orchestra, the choirs of three Johnson City, Tenn., churches—Central Baptist Church, Grandview Christian Church and Munsey Memorial United Methodist Church—will perform in the concert. To purchase tickets, visit the Milligan College Bookstore, open Monday through Friday, 8 a.m. to 5 p.m., or call 423.461.8733. Tickets cost $10 pre-sale, $15 at the door and $5 for students. On Tuesday, April 8, Rouse will give two lectures with more information on the background of John Newton and his sermons on Handel’s “Messiah.” The first lecture will be during Milligan’s convocation at 11 a.m. in the Mary B. Martin Auditorium of Seeger Memorial Chapel and the second will be at 7 p.m. in Hyder Auditorium, located in Milligan’s science building. For more information, visit www.milligan.edu/messiah. Posted by Milligan College on March 3, 2014.